The 2013 Bike Trip has been great so far! I’ve been lucky to enjoy smooth and rainfree riding through the mountains of Virginia to the the waters of the Chesapeake Bay, and also had a wonderful reunion with a treasured friend and her family. Today I explored the history, food, and walkability of Annapolis. More photos later but for now, i hope you like this completely unedited image. This entry was posted in Motorcycles, Photography, The Bike, Travels and tagged Annapolis, Photography, Travel, Traveling Solo, Women Bikers. Bookmark the permalink. Looks like the weather might be on the turn here..
YAY! Looking ok here, too. You stole that line: “the waters of the Chesapeake Bay”! 🙂 Glad to hear you loved Annapolis! Thanks!! Hoping for another good day! Love Annapolis…where I learned to eat crab (and the rule about “when” to eat crab). I’m enjoying your shots and trip very much, thanks for taking us along! Glad you’re along for the virtual ride!! Well for pretty obvious reasons I love the photos. And Annapolis – where John Paul Jones is buried! This is the second time this week his name has come up. It’s amazing to walk in such a historic city. I loved the state house! What an awesome boat (although something tells me it’s kind of like a bike in that I’d find a way to crash the heck out of it)! I watched a sailing class for a bit … little children learning to sail. Impressive!! What a life you lead. Glad you haven’t had to deal with much rain so far – I know when I drive by someone on a motorcycle in the rain, I always feel sorry for them. Magnificent photo of the boat. The sky looks about to flatten the boats in the distance. So much drama going on in that photo. Thanks so much for the comment about the photo! I’ve been frustrated with my inability to upload photos from my camera so cell phone shots will have to do for now. I’ve always said “work hard to play hard” and this vacation has been the perfect get away from work!! I’m a happy woman!! Haven’t been, looks like a place I’d love. 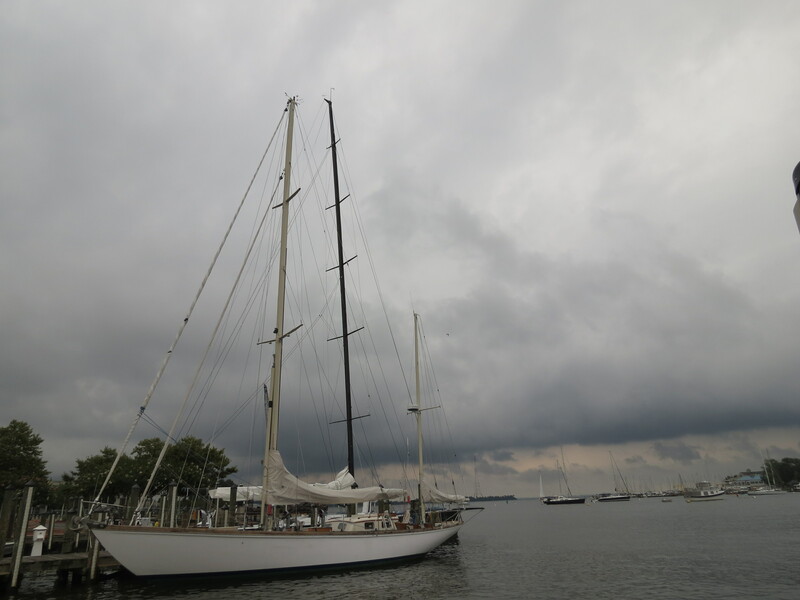 We went sailing in Chesapeake Bay on a Vintage Sloop. Gorgeous! You would love it in Annapolis. The history, food, shopping, water … what’s not to love? I’ll bet that sail on the Vintage boat was amazing!